Today I went to ProWein in Düsseldorf, accompanied by Jan van Roekel. Bordoverview editor Christophe Sevenster was also there - he will stay for a couple of days and will publish later about this BIG! wine fair in rainy Düsseldorf. For now I post some images made earlier today. I'm glad actually I can post these images: last 4 and 5 February Christophe and I combed the Salon des Vins de Loire in Angers for two days, and by mistake I flushed all the images after I got back to Amsterdam. The same happened to most of the pictures from my work experience at Château du Tertre in 2006. I was especially sad about the cool picture with me scooping out a fermentation vat. With boots trapped in the muddy remains of the grapes, and a sweat-covered torso glistening in flash light. An important picture for someone who lives a dressed live behind the computer, at least quite often. Back to ProWein. Today I met Jean Philippe Cazaux from MC Consultant, one of the smaller Bordeaux négociant businesses, a/o active in spotting unknown high potential winemakers and their wines. Followed by - where necessary - helping the winemakers in bringing the wines to the market. The picture shows three of the wines that he was in some way involved in. If you've read this blog before, you might recognize Clos du Jaugueyron. 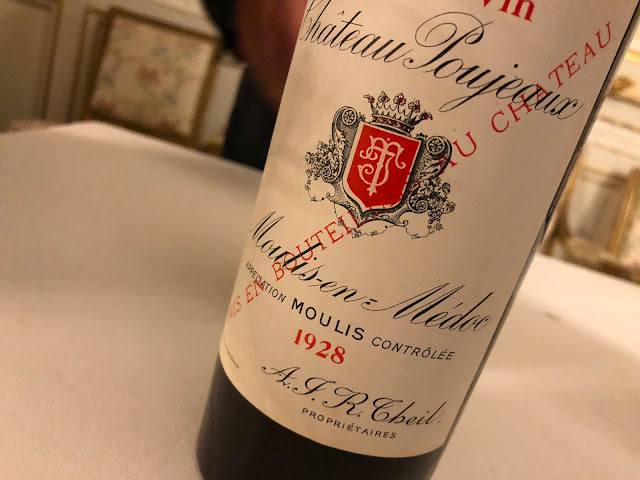 I wrote about the 2003 of this wine, and today I tasted the 2001 - again very good stuff. The other wines are Château Garreau (Côtes de Bourg, there is also a 1er Côtes de Blaye) and Château Pauillac, both very interesting. The vines of Château Pauillac are really in between the vines of Mouton-Rothschild, Lynch Bages, and other cru classés. Over time there have been many transactions between the various properties, and just in between this organised mess are the vine rows of the quite small, and quite unknown Château Pauillac. Here I am flanked by Jean Phillipe Cazaux (right) and Jan van Roekel. Besides the mentioned wines Cazaux sells two petit châteaux that most Dutch readers will know from the supermarket Albert Heijn: Château de Bon Ami and Château l'Argenteyre. At the stand of Bernard Magrez - Pape Clément, La Tour Carnet, Fombrauge etc. - Didier G. from Belgium made us very welcome. It was too bad for him, only, that the juice of Le Clémentin du Château Pape Clément 2005 was so anxious to get out of the bottle that - without clemency - it spattered onto his immaculate shirt and tie... what a dramatic incidence on this spotless spot, Magrez' clean little temple on this big bourse. Most of Magrez' wines are of high quality. But also: they are very well made, and they might lack some individuality. But let's not be a sourpuss, especially the jumpy Clémentine was very good, with lovely round fruit. Finally, I was excited to meet one of the persons behind a wine that I really like, the tiny Listrac-Médoc Clos des Demoiselles (I wrote about this wine in December). An elegant wine, and so is the design of the bottle, and so is... well, it was great to taste the 2005 of this wine. On the picture above Caroline Chanfreau-Philippon is showing the Clos des Demoiselles 2005.